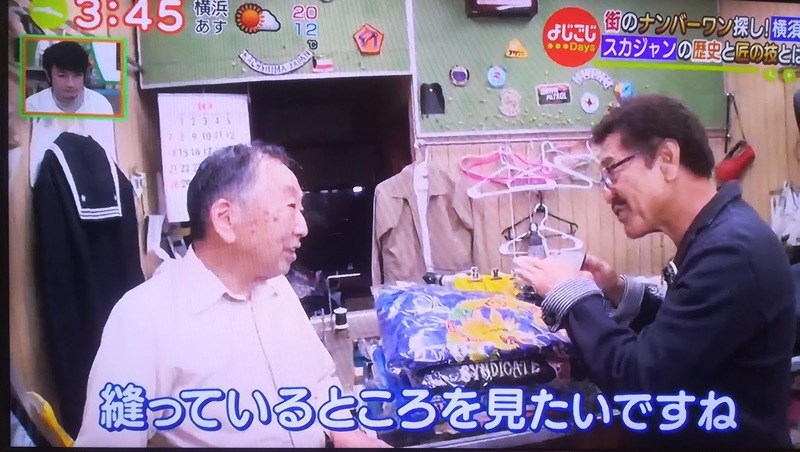 Dobuita Street on Japanese TV Show "YojiGoji Days"
Yokosuka was featured yesterday in TV Tokyo's YojiGoji Days, a daily show with information about daily life in Japan. The on-the-scene reporter was retired boxer and celebrity Yoko Gushiken, who visited some familiar locations in the Dobuita Street vicinity. Gushiken called into a Yokosuka jacket ("Sukajan") shop called First Shokai, whose owner has been hand-making jackets here for around 40 years. "I'd like to see one being stitched". 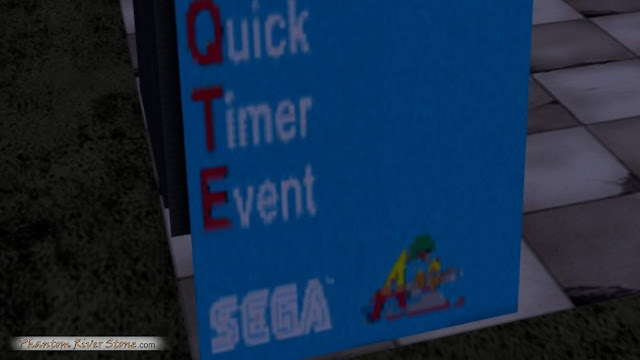 Down at the bottom is a logo of the team Yu Suzuki formerly headed at SEGA, AM2, on the side of the machine! Since it doesn't appear on the game's screens itself, it's a little detail that is easy to miss. P.S. Only a few days left - become a patron of Phantom River Stone this month at any tier and you'll be automatically entered into the draw to win a Shenmue Sacred Spot Guide Map! At the recent Tokyo Game Show held in September, Yu Suzuki appeared on the stage of VR company JPPVR, chiefly to introduce a new game for which he is general producer (see our earlier post for more information). Yu was present at the stage presentation on consecutive days, with the first being on September 20th. However this didn't mean that the topic of Shenmue III was ignored; on the contrary, while on stage Yu took the opportunity to play the latest trailer, "The Prophecy", from Gamescom in September which had until now not been officially shown in Japan. 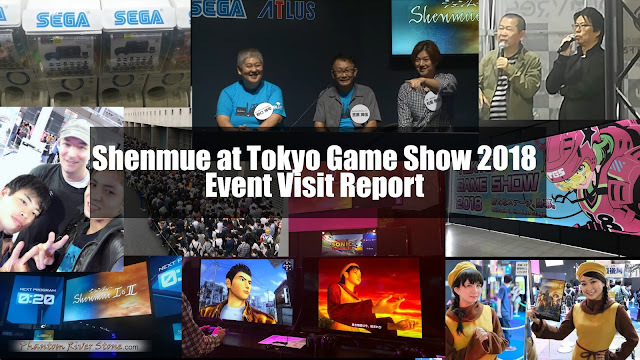 He is asked by comedian Shinya Arino, representing his TV show GameCenter CX, a leading question about what has become of Shenmue. Yu smiles and replies, "I'm making it now!" and plays the trailer. This video was available early to Phantom River Stone's early-access patrons. If you'd like to support more content like this, click the button below. 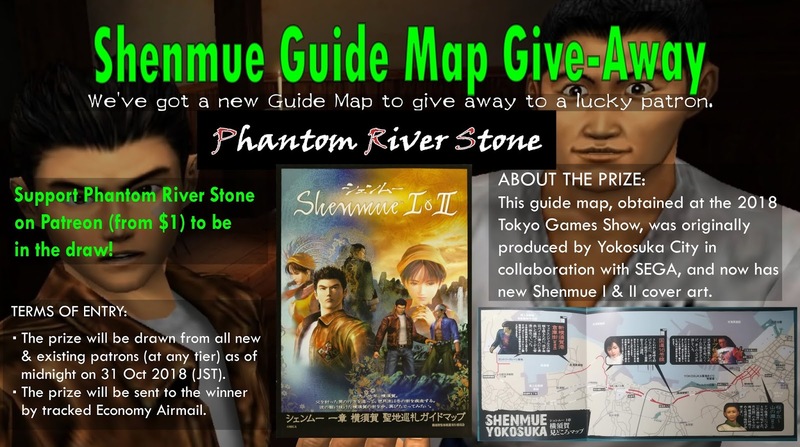 Plus, join this month at any tier and you'll be automatically entered into the draw to win a Shenmue Sacred Spot Guide Map. 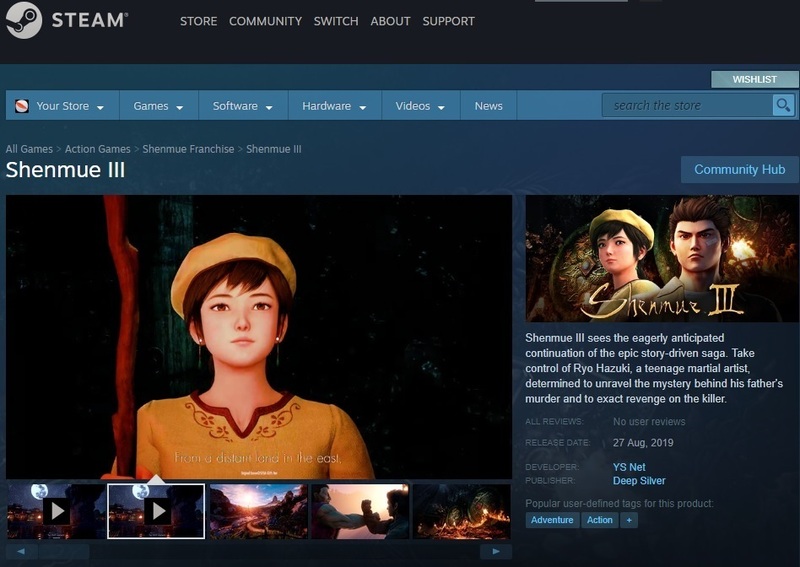 Following the announcement of the Shenmue III release date in August's trailer, the game now has its own store entry on Steam. 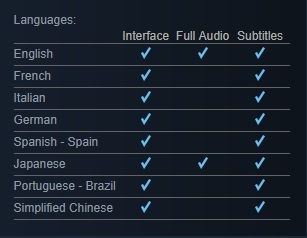 A list of supported languages is provided, although with the game still being under development, any information on the page should be considered subject to change. Furthermore, the page contains two images we have not seen before; the first being the header image on the right-hand side, showing Shenhua and Ryo, with the carved mirrors from the cave behind them. (The image below is the large version, retrieved courtesy of Sappharad). 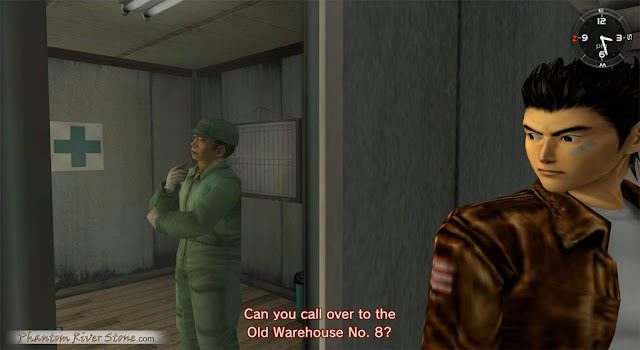 Ryo gets a bit bored with his crate-shifting job and wants a bigger challenge. 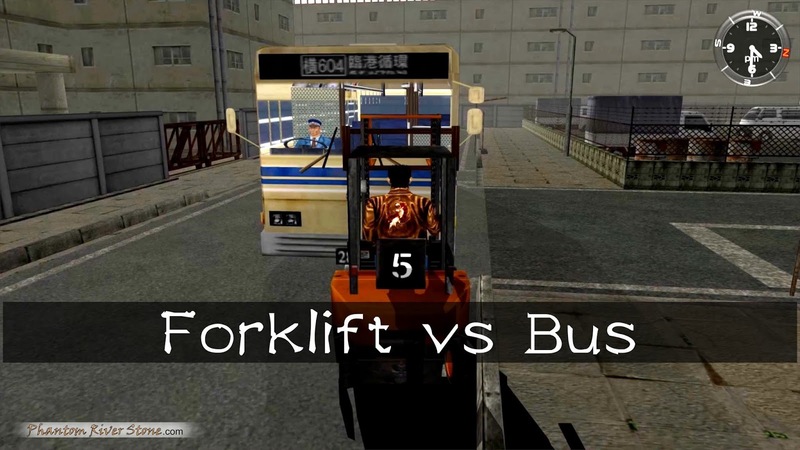 He decides to sneak his forklift out onto the road, and take on the harbor bus! 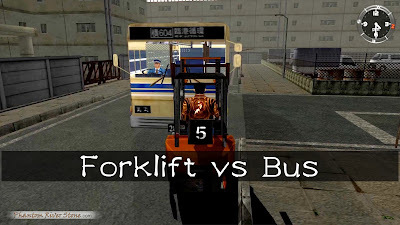 In order to take the forklift outside the normal area, we used our Shenmue I cheat tool. In Shenmue I, Ryo goes to the harbor in Amihama in search of a "Warehouse No. 8", and ends up inside what he assumes is the right warehouse - only to find out this is not the case after he overhears a conversation held in one of the offices between two of the warehouse workers. Ryo learns the bad news. The conversation Ryo overhears takes place as a cut scene, so we never get a good look inside the office apart from what can be seen through the internal window. What would we see if we could view the room from another angle? We applied our Shenmue I cheat tool to disable collision detection before the cut scene starts, and took Ryo outside for a better look. Very kind of you both to stand over there by the window. 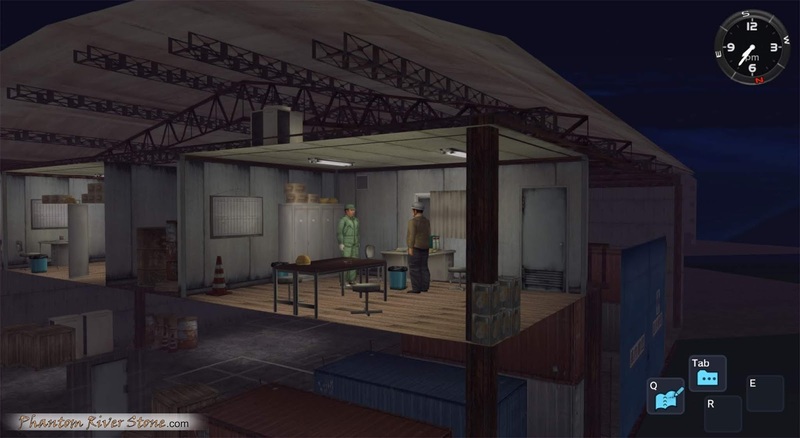 The two workers are already in place, ready to start talking as soon as Ryo approaches. Before the cut scene starts they are silent, stationary and can't be interacted with in any way. We can also get a much better look at the room's contents, including helmets on the lockers and a pile of metal containers in the corner. A better look at the inside of the room. 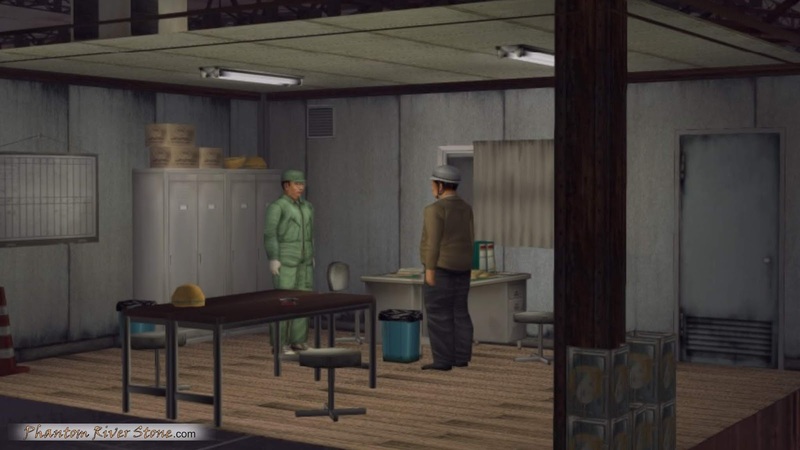 After this, we took Ryo back to the corridor and the workers played out their cut scene, unaware of the unauthorized surveillance - just business as usual! It's a prize give-away! 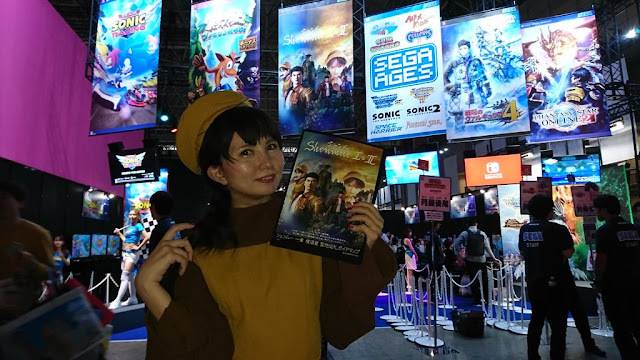 All our patrons have an equal shot at winning a shiny new Shenmue Sacred Spot Guide Map, fresh from the 2018 Tokyo Game Show. 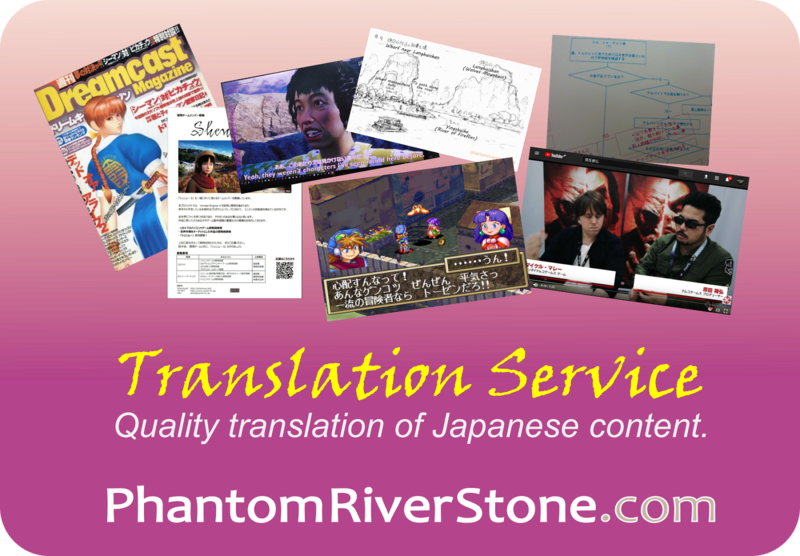 There's no better time to become a Phantom River Stone supporter ($1 at the lowest tier). The entry period closes at the end of this month on October 31st. 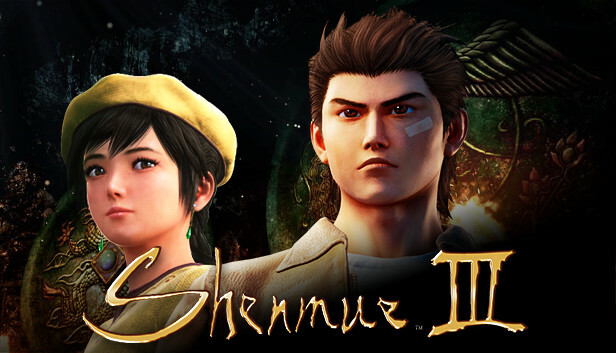 Yesterday, a video was released by Digital Foundry, showcasing leaked footage of a partially-completed remastered version of Shenmue I & II (which we'll refer to as a prototype) that was eventually shelved in favor of a version in which the enhancements were more manageable. 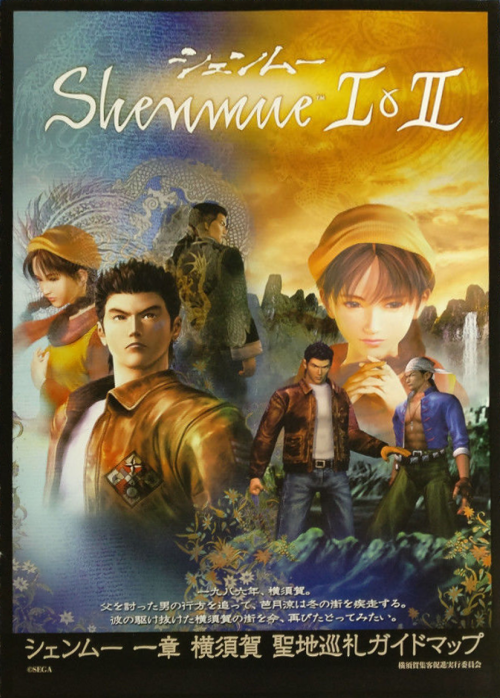 This version was also worked on by d3t, the same development company who went on to develop the Shenmue I & II re-release that was released earlier this year. 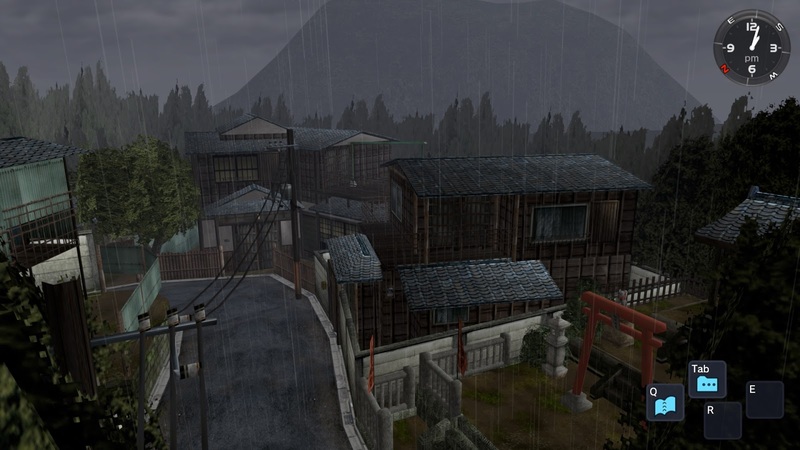 The footage takes the form of a number of camera "fly-bys" around certain locations from the games (the Hazuki Residence, Yamanose and Dobuita from Shenmue I, and a few street areas in Hong Kong), highlighting comprehensively remodeled graphics. "I'm looking for the Yin Tan apartments". Ryo climbs a nearby street light for a better view. This picture was taken using a hack for the PC version of Shenmue II that lets Ryo walk through walls - and in the air. The Shenmue "Sacred Spot" Guide Map is a multi-page tourist pamphlet highlighting locations of interest to Shenmue fans around Yokosuka and is a collaborative effort between Yokosuka City and SEGA. It was originally released at the end of 2017 in both English and Japanese versions (see our video about the map with links to their pdf downloads). A new edition of the map has made an appearance at SEGA's booth at the 2018 recent Tokyo Game Show in September. Shenhua shows off the new edition of the map at TGS 2018. In this post we compare the new version directly with the original, page by page, to see what differences there are. 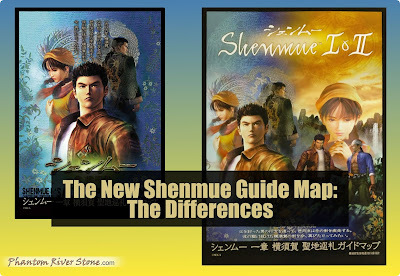 The language of the new version is Japanese (whereas the original map also had an English version). 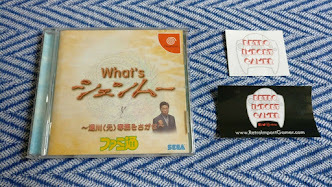 This is understandable, given its purpose as a promotional item for the release Shenmue I & II in Japan, as we shall see. Note: an official pdf of the new map is not available, so photos have been used which may introduce some color variation. 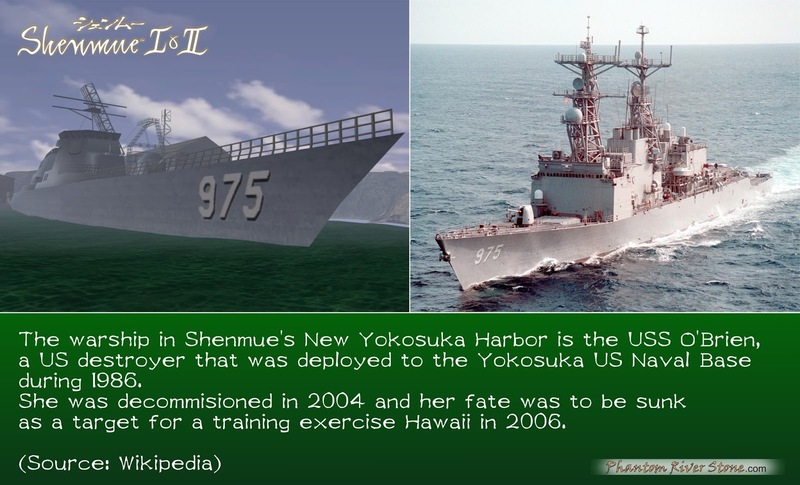 While playing Shenmue it's not unusual to wonder what lies behind some of the inaccessible areas in the game. 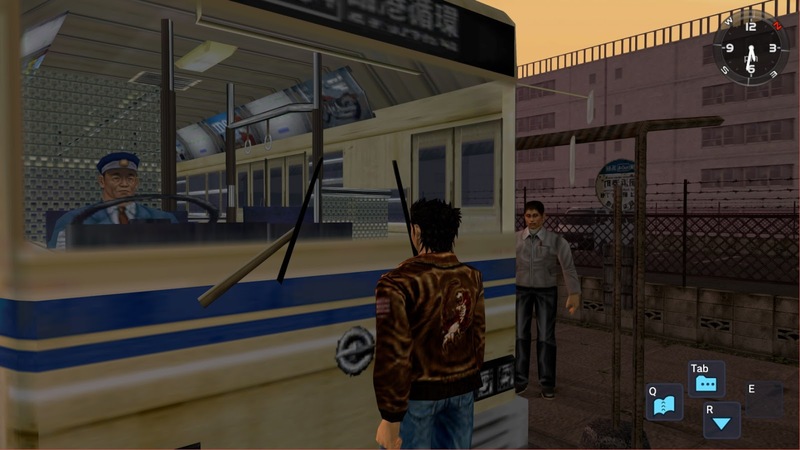 It would be fun to roam around the world of Shenmue outside of the usual boundaries - peeking behind shop counters, strolling over to areas blocked off by walls, or even running out onto the road to play chicken with the traffic. 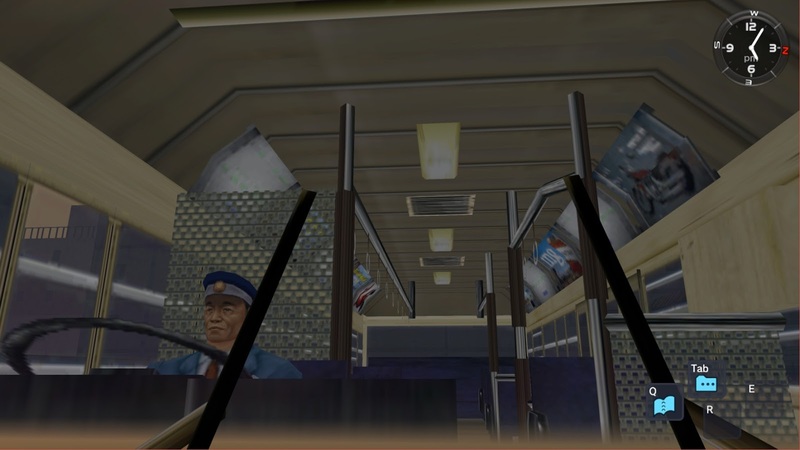 Over the years, talented hackers and modders in the Shenmue community figured out the changes needed to achieve this in the Dreamcast version of the games. And with the re-releases it turns out that a similar approach can be taken for the re-release games, as described in our earlier post. Today we present our automated cheat tool for Shenmue I, a program that allows Ryo to walk past the usual boundaries at the click of a button. 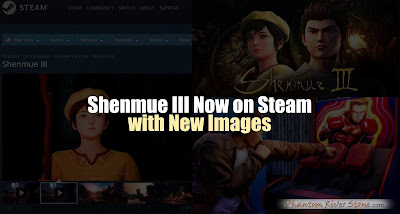 This tool is for use with the PC (Steam) version of Shenmue I. Read on for details on how to use it to go exploring for yourself. The download link can be found at the end of the post. This video, created by James Brown, demonstrates how Shenmue creates the clever illusion of a fully-working mirror within the game. 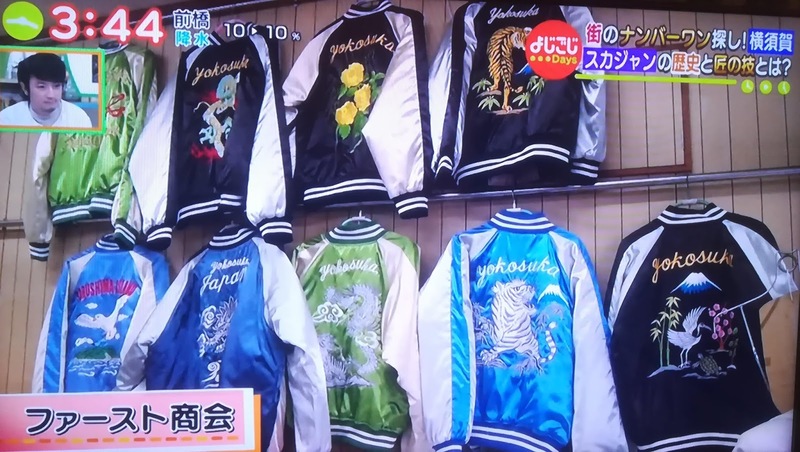 The location is the Russiya China Shop in Dobuita. "I decided to check out the infamous reflection technique that was used back in the day to get around the obvious lack of technology for creating a mirror image! 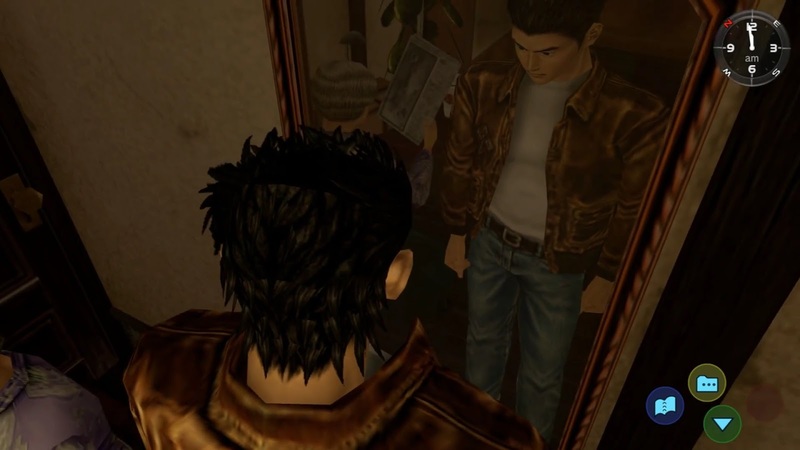 The mirror in Russiya China Shop and the one in Ryo's basement were the 2 obvious choices. I decided to check out Russiya first and even though I knew it was going to happen, it still blew my mind the genius of creating a second room that's mirrored next to the main store, and creating a like for like movement second Ryo so it appears that Ryo's reflection is actually present in the mirror (when in fact it's just a second Ryo character model standing in a second room! 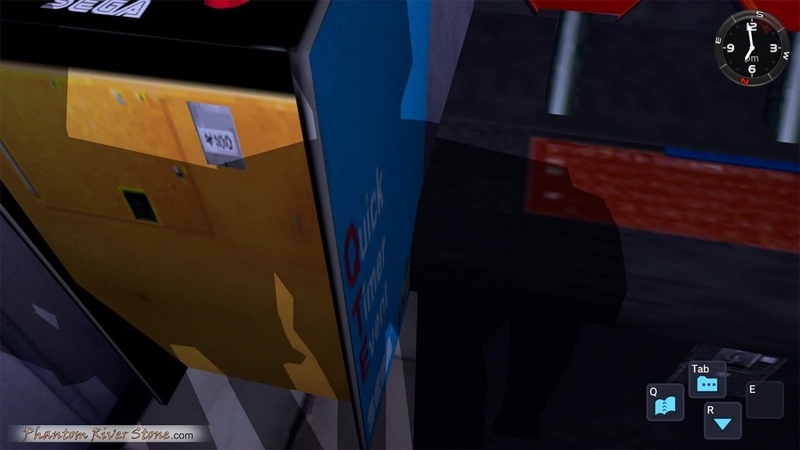 :D )"
The part where Real Ryo speaks to the shop owner from behind the mirror (with Reflection Ryo standing there quietly) is quite creepy! 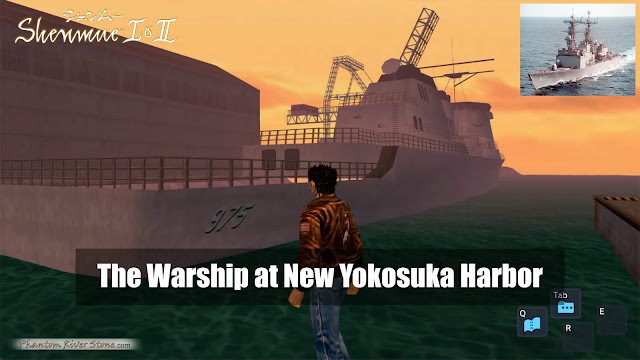 When Ryo explores New Yokosuka harbor in Amihama, he has a view of a battleship sitting across the harbor, but he isn't able to get a very good look at it. And using a hack to allow Ryo to walk outside the normal bounds, we take a walk over to the ship and inspect it up close as demonstrated in this video. Today's topic was selected by the Phantom River Stone blog patrons via our monthly poll. If you'd like to have a say in what subjects we cover next, consider supporting us on Patreon! 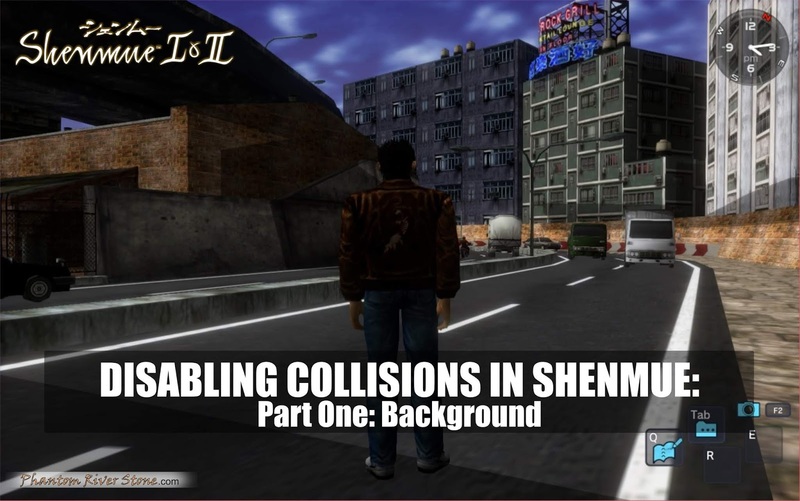 The topic we'll be looking at today is about collision detection in Shenmue. The aim is to allow Ryo to "walk through walls" and roam around the landscape freely, without being constrained by the boundaries normally in place in the game. Part One (this post): some technical background of the knowledge contributed by Shenmue community members on the way collision data is stored in the Shenmue games, and a proposed approach for applying this to the Shenmue I & II re-releases. 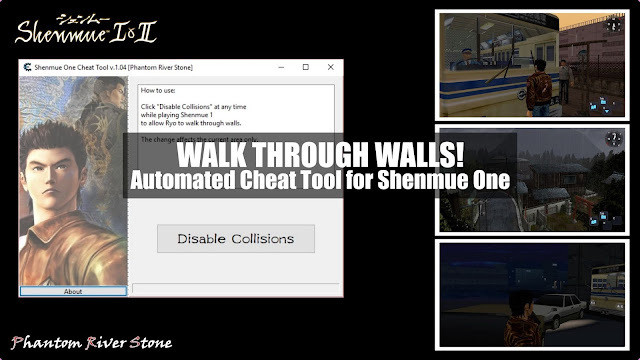 In Part Two, we will provide an easy-to-use file you can run to allow Ryo walk through walls for any area in Shenmue I (on PC). No technical expertise required! Part Three will introduce a tool for Shenmue II. Note: although today's overview is somewhat technical, do not worry if you aren't able to follow everything; in the following posts of this series we will be providing a tool that takes care of all the necessary changes on behalf of the player. 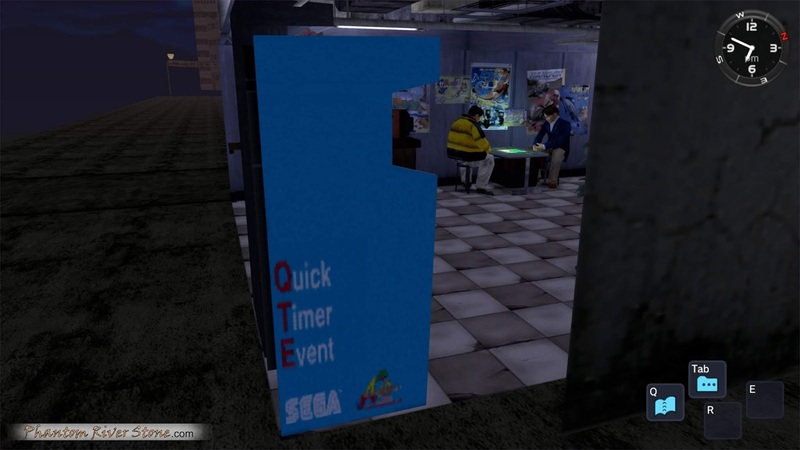 The Shenmue fan community has a strong hacking / modding scene that goes back many years, right to the day the original games were released on the Dreamcast. 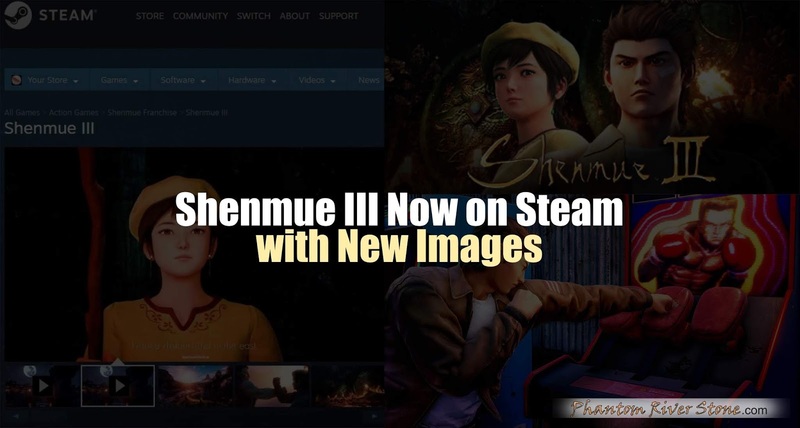 This activity continues with vigor today, new graphic & sound mods appearing already for the recently-released PC (Steam) version of Shenmue I & II. 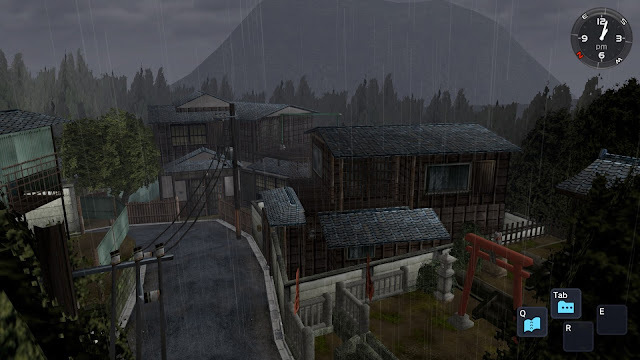 Looking down over Yamanose on a rainy day. 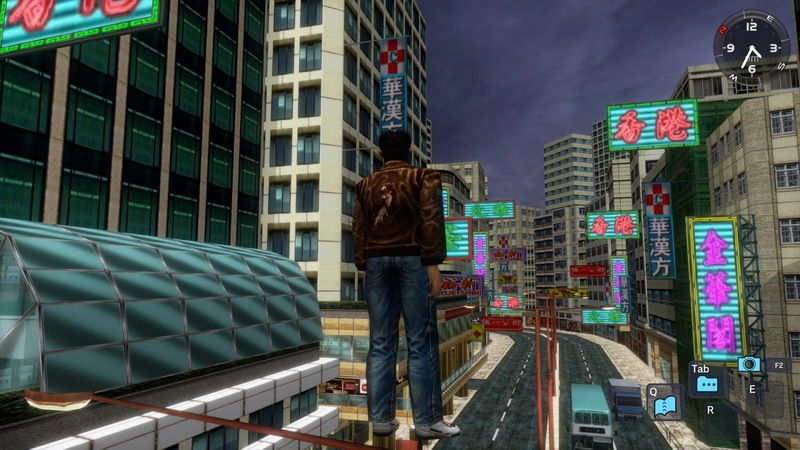 (This picture was taken using a hack for the PC version of Shenmue I that lets Ryo walk through walls - and in the air. We will be covering this hack soon on the blog). Ryo peers through the front window of the bus to get a view of the detailed interior. Advertisements for a motorbike and cigarettes can be seen on the walls. Ryo, you'll make the bus run late! 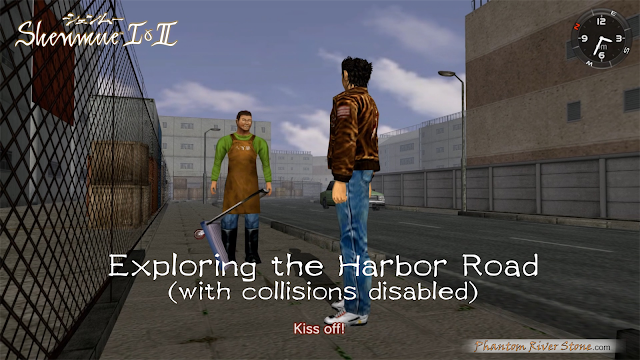 (These pictures were created using a hack for the PC version of Shenmue I that lets Ryo walk onto the roadway. We will be covering this hack on the blog in the near future). "The altar at the Hazuki Residence." 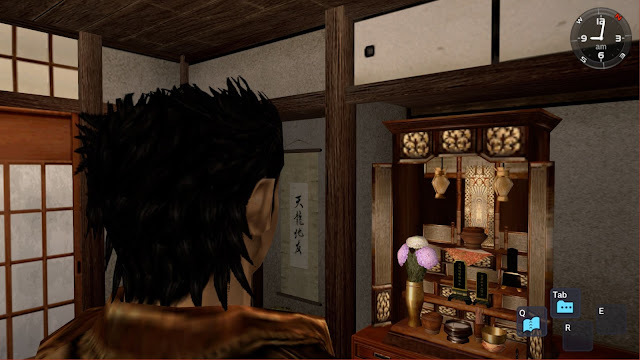 During the game, Ryo vows before this altar to find his father's killer. We'll look at how such altars are a part of day-to-day life for many Japanese households. We'll be releasing it on the blog later this month. If you're interested in reading it early, check us out on Patreon - the $2 tier will get you early access as soon as its ready, plus access to all early-access posts for the month. Or participate in voting for a monthly blog topic at one of the higher tiers. This month we're trying to spread the word about some of the cool rewards we've got for prospective supporters over on our Patreon page, and here's the first! Each week we publish an easy-to-digest news summary we call "Shenmue Shorts", covering the events, Kickstarter updates, industry community news of interest to Shenmue fans over the past 7 days. It's available to all our patrons, at any tier. 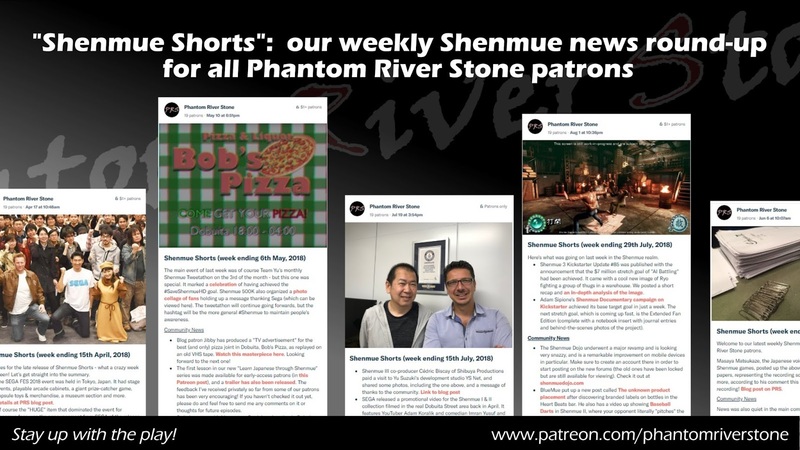 Check out the latest Shenmue Shorts below, and consider joining us as a patron if you'd like to help support the blog & stay up-to-date with Shenmue news! Phantom River Stone has recently passed its 2 year anniversary! As a kind of commemoration, we've set ourselves a fun challenge of reaching 50 Patreon supporters by Oct 31. 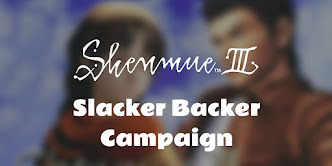 At the end all patrons will go into a draw for a special Shenmue item. If you'd like to help us get there, visit our Patreon page. And of course, thank you to our existing patrons for your support and helping to keep the blog running.